It's not every day that you get to see this kind of spectacle. While previous President hide in the palace and wishes to never cross path with progressive groups, President Duterte once again prove he got the balls to face his staunches critics. He didn't only accommodated his critics, he even went to them and offered to talk. EARLIER: President Duterte makes his way through the crowd to talk with demonstrators outside Batasan. "Peace talks, ituloy!" Protesters chant as Pres. Duterte addresses rallyists outside Batasang Pambasa after his #SONA2017. Duterte asked the protesters for mutual respect. Duterte told protesters: Dumaan din ako sa ganyan. Tanungin niyo si [Joma] Sison. Duterte on political prisoners: Ilan na ang pinalabas ko sa inyo? Palayain ko lahat. Hintay kayo. 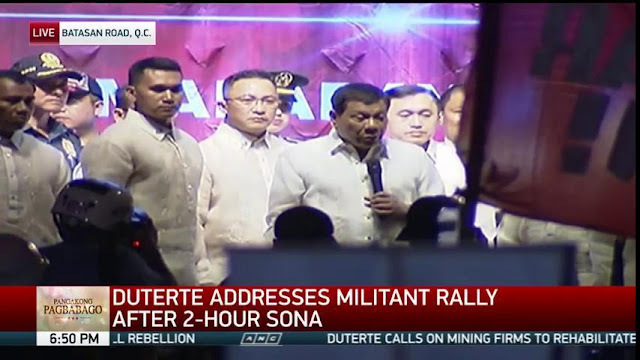 Duterte asked the protesters: 'Yan ba ang gusto niyo? Paano kayo mag-peace talks kung mapatay ako? Sino kausapin niyo? Duterte: If you want to ask something from me, go to Malacañang.